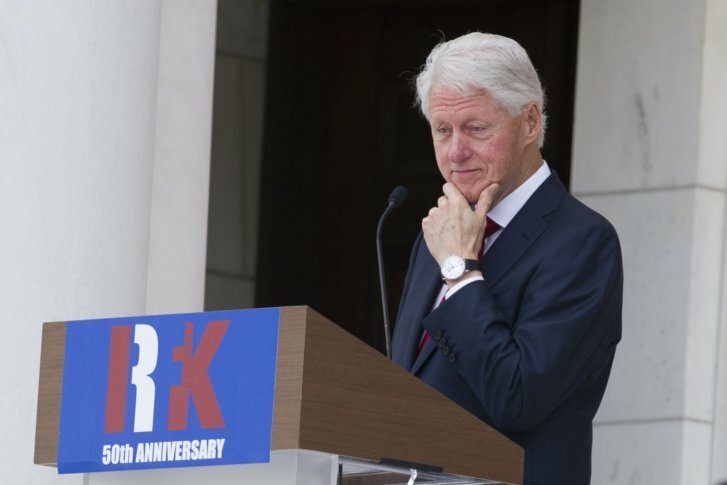 Former President Bill Clinton and members of the Kennedy family will be at Arlington National Cemetery to mark the 50th anniversary of Robert F. Kennedy's death. ARLINGTON, Va. (AP) — Fifty years after his death, Robert F. Kennedy’s words remain powerful. At ceremonies Wednesday at Arlington National Cemetery, speakers paid homage to his oratory by simply reciting excerpts of his speeches to a crowd of several thousand that gathered to remember him. Civil rights leader and U.S. Rep. John Lewis of Georgia quoted Kennedy’s speech after the assassination of Martin Luther King Jr., which occurred just two months before Kennedy himself was shot and killed. “What we need in the United States is not division. What we need in the United States is not hatred but love, and wisdom, and compassion for one another,” Lewis said. “First is the danger of futility: the belief there is nothing one man or one woman can do against the enormous array of the world’s ills — against misery and ignorance, injustice and violence. Yet many of the world’s great movements, of thought and action, have flowed from the work of a single man,” Gonzalez said. At the start of Wednesday’s ceremony at the cemetery amphitheater next to the Tomb of the Unknown Soldier, Kennedy’s daughter, Kathleen Kennedy Townsend, said the family takes comfort in the fact that so many people shared their sense of loss at her father’s death. Dozens of members of the Kennedy clan, including Robert Kennedy’s 90-year-old widow, Ethel, attended the ceremony, which included a rendition of “This Land is Your Land” by country music star Kenny Chesney. Robert Kennedy’s grandson, Massachusetts congressman Joe Kennedy III, spoke about the pictures of his grandfather that he remembers, including his tours of Appalachia and his meeting with farm labor activist Cesar Chavez. “He instinctively led a life of encounter,” Clinton said.